If 2018 was memorable for anything in Earhart circles, it was the news of the birth of the grass-roots movement to erect an Amelia Earhart Memorial Monument on Saipan, which actually occurred in September 2017. The Amelia Earhart Memorial Monument Incorporated (AEMMI) committee is the brainchild of Marie S.C. Castro, 85, the current committee vice president, who is essentially responsible for its existence. Former AEMMI President Rep. Donald Barcinas (Republican, Northern Marianas Commonwealth Legislature, who has since lost his seat), said in February 2018 that at least $200,000 is needed for the successful completion of the monument. I learned about the AEMMI on Feb. 8, 2018, when reader Ken McGhee told me that he’d seen the initial story, “Group to build Amelia Earhart monument on Saipan,” on the website of the Marianas Variety. You can read the original article, which appeared on Feb. 7, by clicking here. Several stories followed in quick succession. My near-joyous announcement, “Finally, some good Earhart news from Saipan” was posted March 2, followed by “Saipan architect unveils planned Earhart Memorial” March 16. Artist’s rendition of the proposed Amelia Earhart Memorial on Saipan, displayed by local architect Ramon Cabrera in the Feb. 7 Marianas Variety story that announced this promising and long-awaited development for the first time. In the March 28 edition of Marianas Variety, my post about Marie S.C. Castro appeared under the headline, “Marie Castro: An iron link to Saipan’s forgotten past,” and an extended version, “Marie Castro: Iron link to Saipan’s forgotten history,” was published here April 2. The stories presented Marie’s accounts of her experiences with Matilde Arriola, one of the best known of the Saipan eyewitnesses, introduced by Fred Goerner in his 1966 bestseller, The Search for Amelia Earhart. Marie’s interview with another of Goerner’s eyewitnesses, “Revisiting Joaquina Cabrera, Earhart eyewitness,” was published here April 17. Marie continues as the prime mover and virtual sole voice in the movement to erect the Amelia Earhart Memorial Monument. With the exception of a few very generous individuals, the response to our year-long fundraising campaign has been cool on this side of the Pacific, and ice cold on Saipan. In an effort to change hearts and minds, in early January 2019 Marie was inspired to write a small booklet about her life and devotion to Amelia’s legacy, intended for distribution on Saipan, “mostly for the locals to educate and induce them to read,“ she told me. She sent me a 20-page draft, which I tuned-up and expanded, and by mid-February, the first of three boxes of Marie Castro: My Life and Amelia Earhart’s Saipan Legacy, arrived on Saipan. 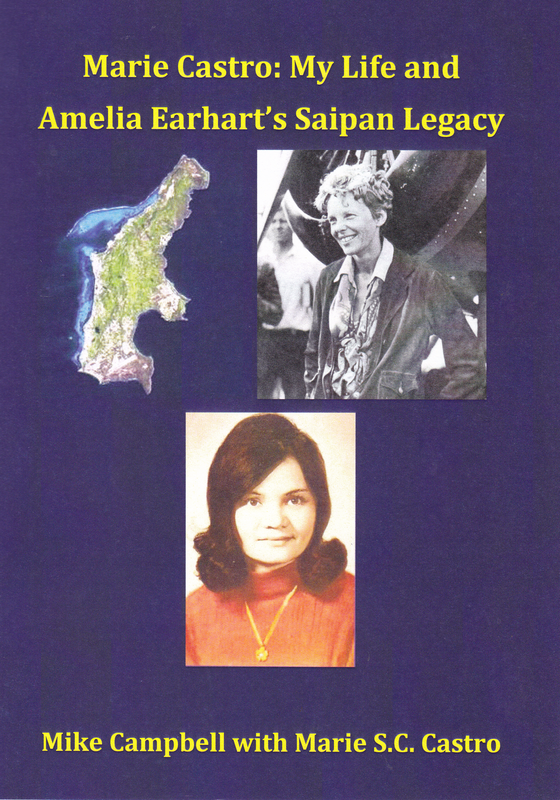 Saipan’s Marianas Variety newspaper published a story about the booklet, “New book about Amelia Earhart on Saipan now available,” by reporter Junhan B. Todiño, on Feb. 25, 2019, and on March 4, Saipan TV’s Ashley McDowell interviewed Marie for a story you can watch by clicking here. The 35-page booklet is available at the Saipan’s Bestsellers bookstore and the Saipan Library, and Marie will ask for donations when she distributes it to those she hopes might be willing to help make the Earhart Memorial Monument a reality someday. I think it’s appropriate that readers everywhere see it, and hope that some might be moved to help Marie on Saipan, at the address listed at the top right of the front page of this blog. 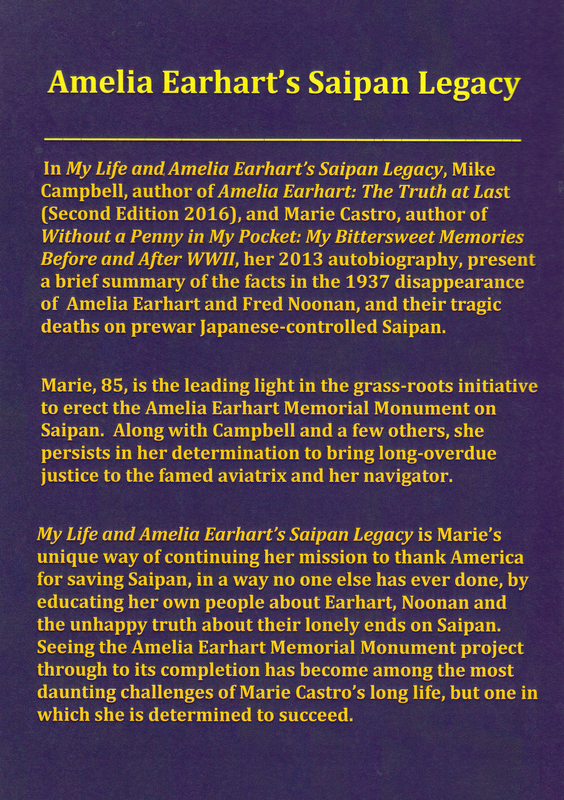 In My Life and Amelia Earhart’s Saipan Legacy, Mike Campbell, author of Amelia Earhart: The Truth at Last (Second Edition 2016), and Marie Castro, author of Without a Penny in My Pocket: My Bittersweet Memories Before and After WWII, her 2013 autobiography, present a brief summary of the facts in the 1937 disappearance of Amelia Earhart and Fred Noonan, and their tragic deaths on prewar Japanese-controlled Saipan. Marie, 85, is the leading light in the grass-roots initiative to erect the Amelia Earhart Memorial Monument on Saipan. Along with Campbell and a few others, she persists in her determination to bring long-overdue justice to the famed aviatrix and her navigator. My Life and Amelia Earhart’s Saipan Legacy is Marie’s unique way of continuing her mission to thank America for saving Saipan, in a way no one else has ever done, by educating her own people about Earhart, Noonan and the unhappy truth about their lonely ends on Saipan. Seeing the Amelia Earhart Memorial Monument project through to its completion has become among the most daunting challenges of Marie Castro’s long life, but one in which she is determined to succeed. I’m currently 85 years old, and what has happened in my life is quite amazing. 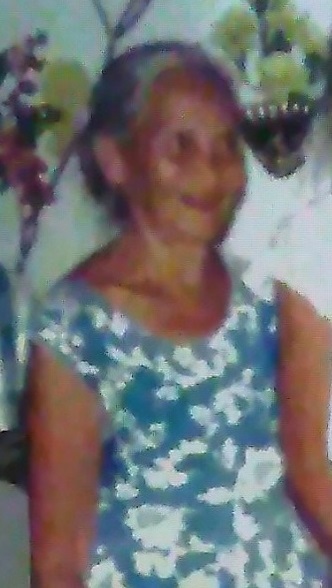 For starters, and quite briefly, I lived in Kansas City, Missouri for 50 years and decided to sell my great home at 100 Garfield Avenue, also known as Tiffany Castle, and move back home for good to Saipan, the largest island in the Commonwealth of the Northern Mariana Islands, or CNMI. In 1966 I was sent to Kansas City as a nun to complete my higher education. During the 1960s and ‘70s a big transitional movement was under way in the Catholic Church for clergy and religious to reflect on their vocations. I believe it was Pope St. John XXIII who issued a Decree for priests and nuns who questioned their vocation to go on sabbatical leave for one year. I prayed to the Holy Spirit to guide me in my decision, and I decided to relinquish my vows as a nun. I believed I made the right decision. Although I am no longer in the religious life, I maintain my Catholic Faith and training that has served as a strong guide and anchor in my secular life. I never forget what the American military endured in World War II in order to free the people of Saipan from oppression, and I dedicated my life to education. I decided to remain in Kansas City and teach in school, where I could help children and reciprocate in my own small way to this great country. I taught two years at Ozanam Home for Boys, an institution for emotionally disturbed youngsters, and then applied to the Kansas City Missouri Public School System, where I taught for 25 years and retired in 1998. I felt it was a big accomplishment in my life in helping children to make a difference. Later I spent time doing voluntary work, as well attending courses and lectures until I came back home for good in 2016. I took lots of pictures of the castle to show to my mother and my family before I went to Saipan in the summer of 1989. Everyone admired the beauty of the woodwork and the stained glass around the house. 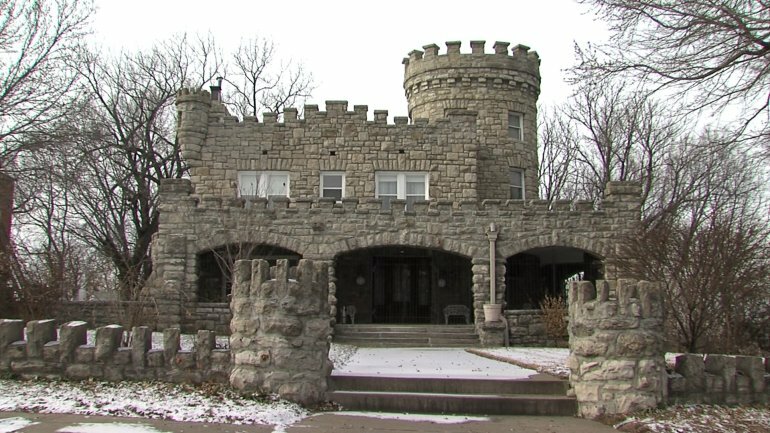 When I came back to Kansas City from that vacation, I called the realtor to make an appointment to see the castle once more, so I could definitely decide what to do. I met with the realtor at the castle at 2 o’clock one afternoon. 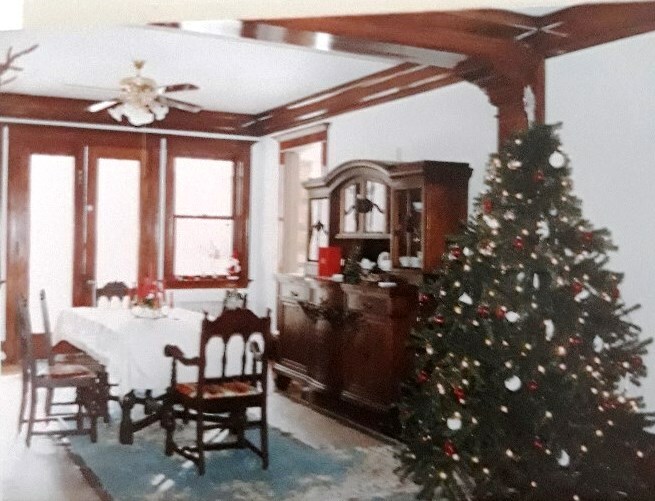 As she opened the big front door, I was mesmerized with the beauty of the woodwork, the high ceiling and a big mantle with a huge mirror built over it. The realtor led me up to a beautiful spiral stairway to the second floor and a big master bedroom with five other bedrooms. Next we went on to the turret, where we could see the Missouri River, overlooking Kansas City, downtown and the residential areas all around. It wasn’t easy to sell that big historic mansion, but finally after four years on the market an interested person made an offer after touring the castle. After 26 years in this house, leaving was an emotional and difficult experience. It was a special home for me, not only considering it as my home on earth, but especially after having found out through my research on the castle that it was built in 1903. Right then, the connection with my mother became even more meaningful to me. It seemed to be a sign, in that my mother was also born in 1903. Although I was over 8,000 miles away from her, I always felt the closeness between the two of us. The castle served as a therapeutic home, a kind of extension of the intimate love of a mother. I had sold my property on Saipan during the economic boom in the late 1970s-early ‘80s when the Japanese were investing on the island. The castle was badly in disrepair and the price was affordable, so I was able to put a down payment and then applied for a mortgage. The Tiffany Castle, one of the historic mini-mansions in Kansas City, Missouri, and my home for 26 years. After a month this huge commitment began to sink in, but my determination to own it was stronger than the financial burden. I thought nothing is easy in this world. I went back home feeling satisfied at my accomplishment that day. That evening I wasn’t able to sleep until 3 a.m. for that incredible decision I made. 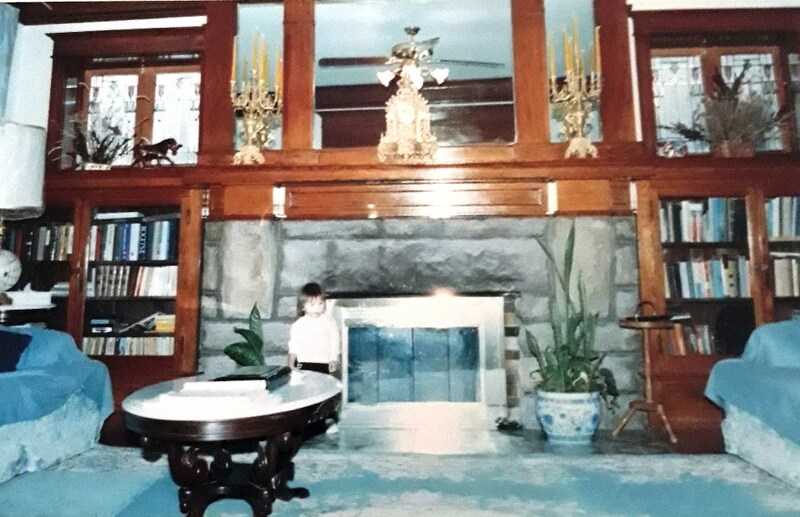 Later I remembered my realtor told me, “Marie, the house was meant for you.” I believed she was right, because for the 26 years I lived in that house I enjoyed every minute and every corner of the house. It was my heaven on earth. I wish my mother would have had the opportunity to taste the beauty of that house. It was a daring decision and huge undertaking for a single person like me to plunge into a big investment. Above: The stone fireplace flanked by four stained glass windows flanking the big mirror. Below: the dining room at Christmas. University of Missouri Kansas City. The castle was completely empty when I bought it. To find the most appropriate set of furniture to furnish the castle was not easy, but finally after over three years the house was well furnished, appropriate to its unique style. My mother, Virginia C. Castro, left, was recovering from her minor heart problem at the hospital when I came for my yearly summer vacation to Saipan. I spent as much time as I could with her that summer; the thought of leaving her was so painful to me. Three days after I arrived back in Kansas City, I got a call from my brother Gus, who said, “If you want to see Mother for the last time, come home as soon as possible. She is in critical condition.” I made my plane reservation and flew the next day back to Saipan. I prayed so hard during my flight that I would see my mother alive before she departed. I arrived at Saipan at 8 p.m. the next day. My brother was at the airport to meet me, and we went directly to the hospital. As I entered her room the family had just finished praying the Rosary by her bedside. As I bent and kissed her, I said “Mother I am here, si Daling.” Mother opened her eyes and smiled at me, and I knew she was waiting for her daughter. 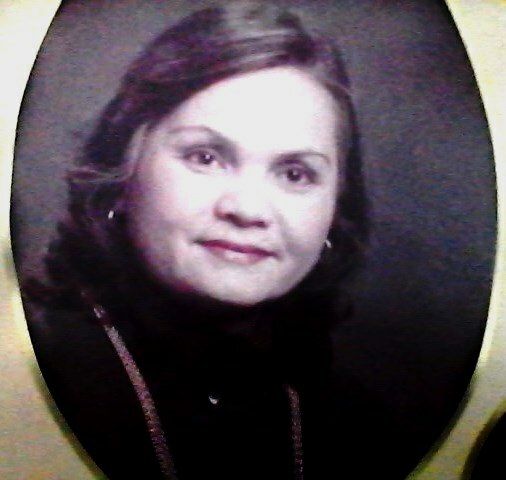 I was fortunate to stay at my mother’s bedside, giving her my last assistance for five days until she died on Aug. 6, 1990. In 2013, my book, Without a Penny in my Pocket, was published through funding provided by the Northern Marianas Humanities Council. Its subtitle, My Bittersweet Memories Before and After World War II, well summarizes its contents. 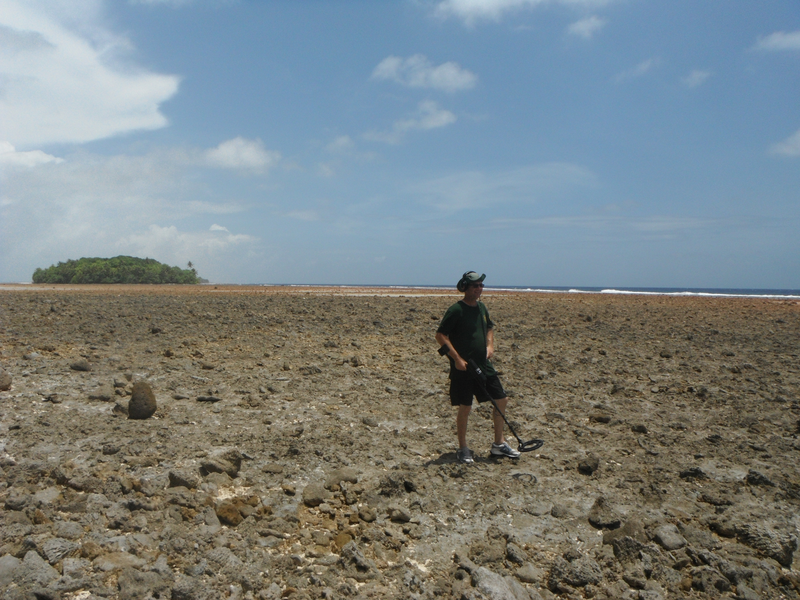 William H. Stewart, former senior economist for the Northern Marianas and a career military-historical cartographer and foreign-service officer in the U.S. State Department, wrote a very nice, comprehensive review of Without a Penny in November 2014. I urge interested readers who want to learn more than I can offer in this small booklet to obtain a copy of Without a Penny in my Pocket. Two years later, on Oct. 13, 2016, I returned to Saipan for good and wondered, “What am I to do now?” Perhaps I would be bored, but interestingly enough, a few months later I remembered Matilde F. Arriola, whom I interviewed about Amelia Earhart in 1983. Perhaps this was what had been bothering me in the back of my mind the year 2017 in connection with 1937, 80 years ago when Amelia Earhart’s plane came down in the Pacific with her navigator Fred Noonan and eventually was brought to Saipan by the Japanese. I began considering this event that happened in 1937 on Saipan. At that time, people were subject to strict Japanese governance. We had no rights on our own island. People were ordered to comply with any ordinance given by the Japanese regime. Any infraction would result in punishment, and depending on the severity of the offense, the price could be terrible and devastating. 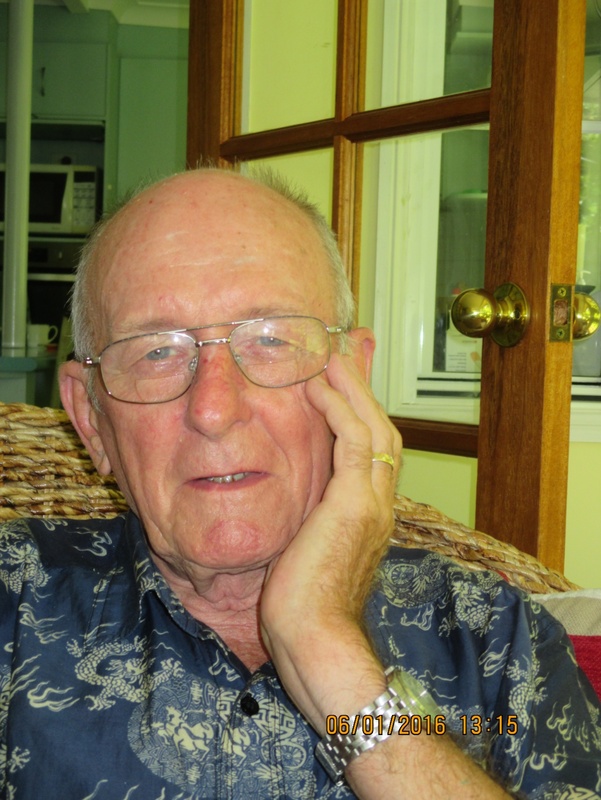 The people lived in constant fear, which had become the normal daily environment on Saipan. Japan’s economic interests on Saipan were mainly to subsidize her own people. Much of the land was used to cultivate tapioca and cotton, but most of it was devoted to sugarcane plantations. The production of sugarcane became so large that the country decided through an entrepreneur businessman named Matsue to build a sugarcane factory on Saipan. 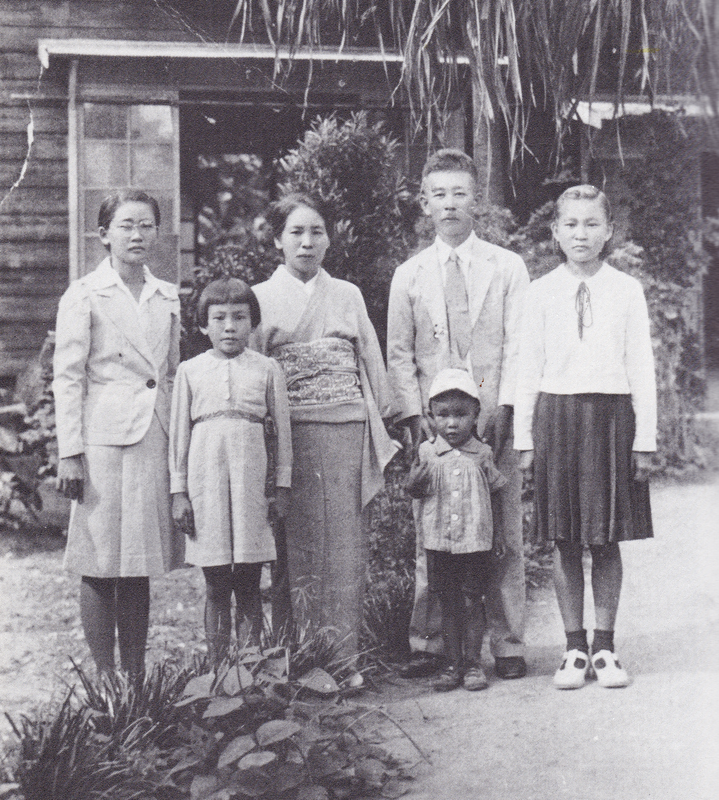 He brought in large numbers of workers from the island of Okinawa to work in sugarcane fields as well as in the factory. Interestingly enough, only a few Saipanese who were conscripted by the government in 1937 happened to witness an event that the locals had suppressed in their minds until the war ended. After the liberation of Saipan in the summer of 1944 and people were encamped at Camp Susupe, fears suppressed by the people for so long during the Japanese regime began to unravel, and the seeds of freedom the American victory had planted began to bear fruit. I remember Joaquin M. Seman and his friend Frank Deleon Guerrero, who came to our house one evening for a social visit and told the story about an American woman pilot who wore a man’s outfit with short hair. The woman pilot was the great Amelia Earhart. It was so strange to them, as they had never seen a woman dressed like that, as according to the Chamorro culture, woman always wore dresses. In early February 2017 I met with Robert Hunter at his Department of Community and Cultural Affairs (DCCA) office and Rep. Donald Barcinas and explained my idea. The presence and death of Amelia Earhart on Saipan is a very unpopular subject here; however, I believe that it should be recorded in our history, for many important reasons. These include recognizing Amelia as the American woman pilot who so exemplified the fearless spirit of adventure that so characterized the early aviation pioneers, and to finally offer those who are interested in Amelia a monument on Saipan, where she met her tragic fate. Amelia Earhart endures in the American consciousness as one of the world’s most celebrated aviators, and she remains a symbol of the power and perseverance of women who are determined to achieve a lofty goal, and the adventurous spirit so essential to the American persona. The last time I checked, the CNMI is still a part of America. Now the New York Times and longtime establishment shill and Earhart biographer Susan Butler have joined the growing herd of media vermin in denouncing the truth about Amelia Earhart’s presence in the Marshall Islands and death on Saipan. This was the scenario a few briefly pretended to advocate while selling bogus photo claims made by the History Channel and promoted by NBC News on July 5, setting off several days of media buzz over a photo later found to have existed in a Japanese travelogue two years earlier. In a July 11 Times Op-Ed piece, “Searching for Amelia Earhart,” Butler, who continues to disgrace her avowed “profession,” again proves she has learned nothing since the publication of Amelia Earhart: The Truth at Last, in which I spend 12 pages (306-318) figuratively taking this woman to the woodshed and exposing the falsehoods and misrepresentations she advanced in her 1997 biography East to the Dawn: The Life of Amelia Earhart. Few have been more transparently dishonest in their published opposition to the truth than Butler, whose intransigence in this matter, though disturbing, isn’t surprising. In fact, it’s what we’ve come to expect. Susan Butler, a leading apologist for the provably false establishment line that Amelia Earhart was never on Saipan, or anywhere else, for that matter. Will shameless government shills like Butler, who want to keep Amelia and Fred Noonan in the safe confines of romantic myth, flying into the eternal ether, ever cease their advocacy for the phony Earhart “mystery”? “No concrete evidence”? 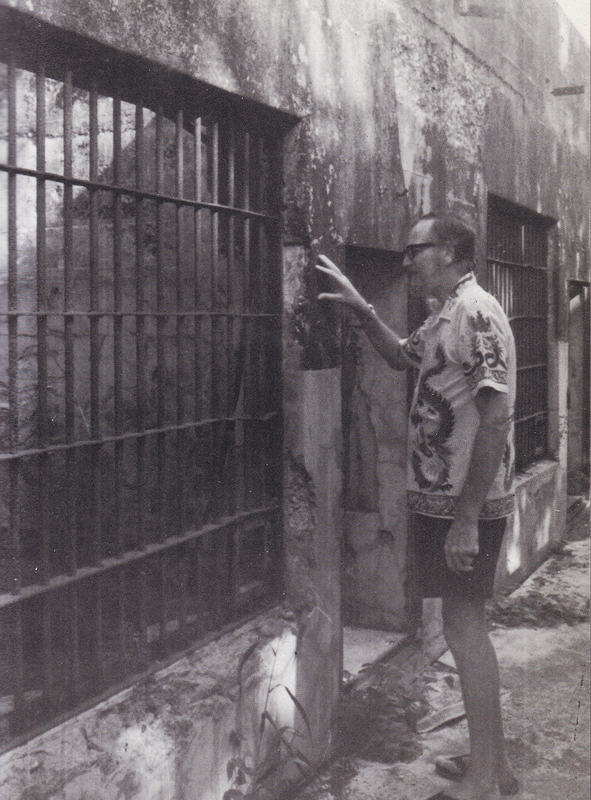 Murderers are convicted and sent to their deaths on the smallest fraction of the evidence Goerner collected in just his first visit to Saipan, in the summer of 1960. Dr. Manual Aldan, who was a dentist on Saipan in 1937, told Goerner the Japanese officers he treated told him the name of the American woman flier in their custody was “Earharto!” Many other local Chamorros identified Earhart and Noonan from photo lineups Goerner presented them, and of course we have the well-known account of Josephine Blanco Akiyama, most recently seen in a brief interview presented in the History Channel special, as Josephine, alive and well at 91 in San Mateo, Calif., cast her pearls to swine and agreed to talk to interviewers whose only purpose was to use her as a tool in their disinformation drill. Butler’s hatred of Goerner’s findings and his groundbreaking Saipan investigations screams loudly in every word she writes. Just as the producers of the History Channel Earhart special refused to credit anyone for the few new witness accounts they presented, Butler refuses to name Fred Goerner as the author of the 1966 bestseller, The Search for Amelia Earhart, which established the presence and death of the fliers on Saipan, but now comprises only about 5 percent of the knowledge we have that puts them in the Marshalls and Saipan. On July 1, 1960, local residents picked up their copies of the San Mateo Times, to see this headline: “Exclusive: Amelia Earhart Mystery Is Solved,” in 100-point capital letters, with the story, “Famed Aviatrix Died on Saipan,” by Linwood Day, stunning the relatively few Americans who learned of it. That story is as true today as it was in 1960. Fleet Adm. Chester W. Nimitz. commander in chief Pacific Fleet during World War II, is spinning in his grave these days as the lies about the fate of Amelia Earhart and Fred Noonan continue to surround and overwhelm his famous comment to Fred Goerner that revealed the top-secret truth about the capture of the fliers in the Marshall Islands. 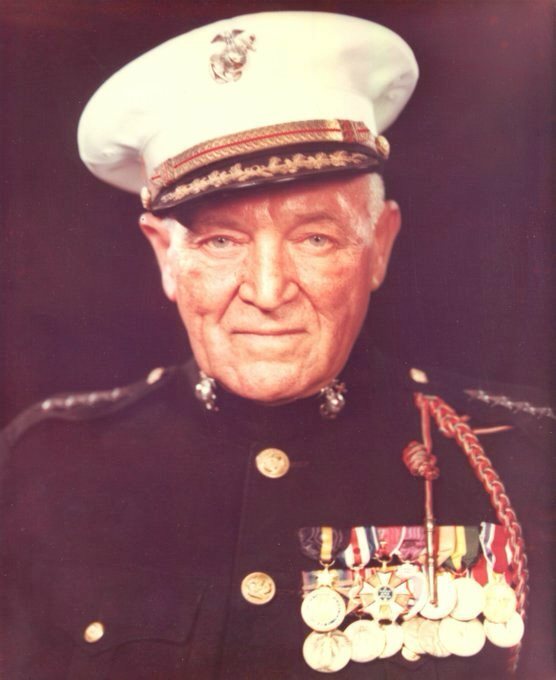 Retired Fleet Adm. Chester W. Nimitz told Goerner in 1965, “Now that you’re going to Washington, Fred, I want to tell you Earhart and her navigator did go down in the Marshalls and were picked up by the Japanese.” Two other U.S. flag officers, Marine Gen. Alexander A. Vandegrift, 18th commandant of the Marine Corps, and Marine Gen. Graves Erskine, who was second in command of the V Amphibious Corps during the invasion of Saipan in the summer of 1944, told Goerner and two associates that Amelia Earhart died on Saipan. 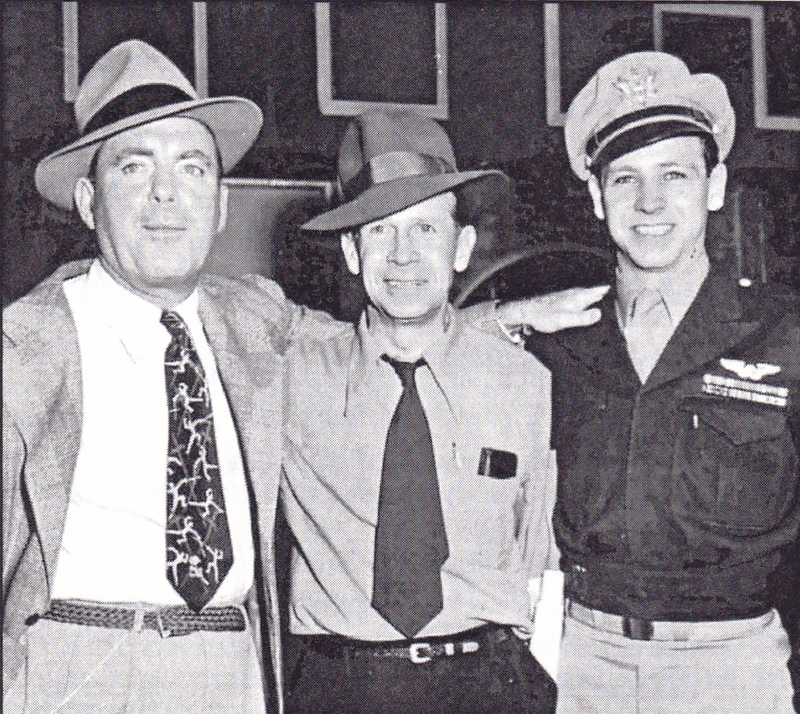 Twenty-six former GIs, veterans of the Saipan campaign, told Thomas E. Devine, author of Eyewitness; The Amelia Earhart Incident (1987) their eyewitness accounts that revealed the presence of Earhart’s plane, Lockheed Electra NR 16020, which disappeared on July 2, 1937, as well as their knowledge of the presence and deaths of Earhart and Fred Noonan on Saipan. The list goes on, and I don’t need to re-write the chapters of The Truth at Last that overflow with evidence that expose Butler’s pathetic establishment talking points as the stinking smoke of mendacity. “No concrete evidence”? Readers of this blog and The Truth at Last are familiar with the mountains of evidence that reveal the truth, while the so-called crashed-and-sank and Nikumaroro “theories” are actually glorified lies that lack even the most rudimentary basics required of scientific theories. It’s simply amazing to behold how the American people have been sold such a bill of bad goods for so long. I’m certain, as well, that if the Earhart Electra were actually located beneath the tarmac at Saipan International Airport, or the excavated skeletons of Earhart and Noonan were presented for DNA analysis that confirmed their identities, our establishment media would suppress that information as fully as possible. 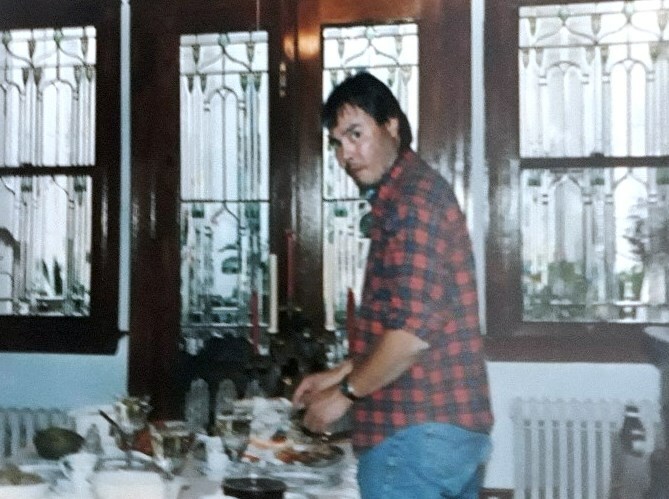 In a September 2007 phone interview, Aoki, who visited Goerner at his home in San Francisco in late June 1982, denied writing that Goerner suggested possible scenarios to native witnesses, and said she thought Butler may have misrepresented or possibly misunderstood what she told the biographer in a 1997 interview. “I would never say that about him,” she told me from her New York home. “That’s terrible. I can’t criticize Fred like that; I respected him. He was a really nice person and a good friend of mine.” Aoki said Goerner’s death in 1994 “was kind of devastating,” but she confirmed that Butler had accurately reported her conclusion in Searching For Amelia — that in her opinion, Earhart was never on Saipan. Undated photo of Japanese journalist Fukiko Aoki, who told Fred Goerner she wanted to help him in his Earhart investigations in the early 1980s. As it turned out, Aoki was anything but helpful, at least from Goerner’s point of view. 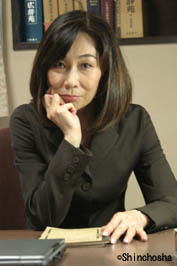 I contacted Butler by email to ask her about Aoki and her ideas about Saipan. All of this is chronicled in detail in Amelia Earhart: The Truth at Last. The fact that this book had been blacked out by all major media until this past week, when the Washington Post finally broke through with the Amy Wang and Cleve R. Wootson Jr. July 11 piece,“A ‘bogus photo,’ decades of obsession and the endless debate over Amelia Earhart,” could not possibly have prevented Butler from knowing about the 12-page section I devoted to her phony claims. Euphemistically titled, “An Earhart Biographer’s Serial Misstatements,” I would wager that these pages were more than anyone had ever written about her work, in any format, and it is inconceivable that Butler did not know what The Truth at Last revealed about her so-called “research.” But it meant nothing to her, because facts mean nothing to these enemies of the truth, whether it’s the Earhart story or any other focus of their lies. Susan Butler, an American author of a major Earhart biography, echoes the Japanese government’s policies of deceit and denial, not only in the Earhart case but in its verifiably false claims about Saipan’s military posture several years before Pearl Harbor. While Fukiko Aoki’s motivation in advancing such nonsense is easily discerned, Butler’s is harder to fathom, yet is sadly typical of the American establishment’s hostility to the truth about Japan’s dark history. Whether Butler’s endorsement of Aoki’s findings was rooted in a conscious decision to mislead, simple historical naiveté, or abject incompetence is uncertain, but all are unacceptable in a popular biography of Amelia Earhart, and the result is the same: Readers are badly misinformed. We can justifiably ask whether Susan Butler would have been as casual in advancing her baseless claims against Goerner, who died five years before East to the Dawn was published, if he’d been around to defend himself. We’ve seen an inordinate level of media activity during the past 10 days, virtually all of it devoted to a phony story about a bogus photo, followed by the subsequent debunking of the false claims made about the photo. When the false claims about the photo were exposed, as planned, anything of value in “Amelia Earhart: The Lost Evidence,” was contaminated. The goal of the whole exercise was solely to further discredit the hated truth about the fate of Amelia Earhart and Fred Noonan. Nothing will be followed-up by an establishment still protecting the checkered legacy of President Franklin D. Roosevelt, whose refusal to help Amelia when she in Japanese captivity, if officially revealed, would even now be a catastrophe for Democrats who still revere FDR as the New Deal Savior of America. Sadly and as always, too many Americans simply don’t care enough about the disappearance of Amelia Earhart to even question the false talking points offered by Butler and others who are always eager to lead them astray. Will shameless government shills like Butler, who want to keep Amelia Earhart and Fred Noonan stashed away in the safe confines of romantic myth, flying into the eternal ether, ever cease their absurd advocacy for false solutions to the phony Earhart “mystery”? Not a chance, unless the U.S. government itself finally decides that the time for “full disclosure” in the Earhart case has finally come. Don’t hold your breath. 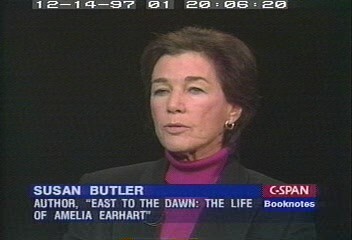 The long-awaited Second Edition of Amelia Earhart: The Truth at Last is now available at Amazon.com and Sunbury Press. The new book, a large 7″ by 10″ paperback offering 370 pages at the same low retail price of $19.95, adds two chapters, a new foreword, several new subsections, the most recent discoveries, rare photos and a near-total rewrite to the mountain of overwhelming witness testimony and documentation presented in the first edition of Truth at Last. The result is the most compelling, comprehensive presentation of the indisputable facts that reveal the stark truth about the Marshall Islands and Saipan presence and deaths of Amelia Earhart and Fred Noonan – a tragic story that American’s ruling class still doesn’t want the public to know, for reasons revealed in the Second Edition of Amelia Earhart: The Truth at Last. The Kindle version of the Second Edition is not yet ready; readers will be advised immediately when it becomes available. Nearly everything the American public has seen, read and heard in the media for nearly 80 years about the so-called Amelia Earhart mystery is intentionally false or inadvertently misleading. The widely accepted myth that the disappearance of Amelia Earhart and Fred Noonan during their ill-fated world-flight attempt in July 1937 is among the greatest aviation mysteries of the 20th century is an abject lie, the result of decades of government propaganda that continues unabated to this day. 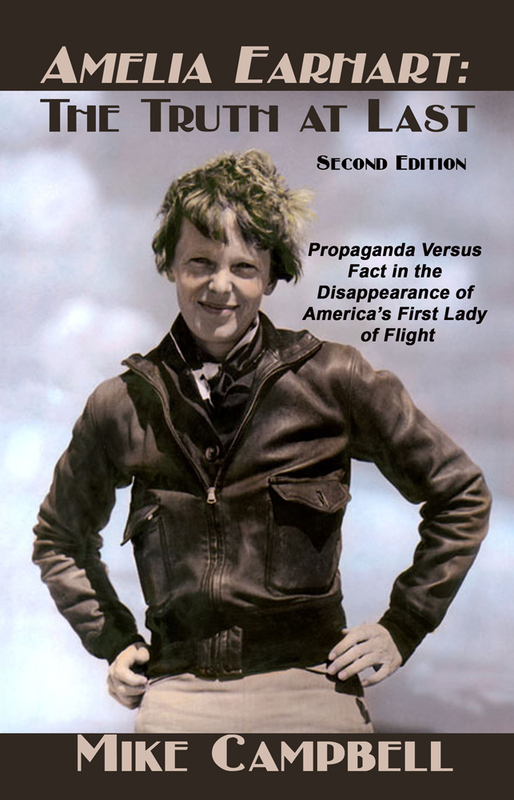 The Second Edition of Amelia Earhart: The Truth at Last, a much improved and far more comprehensive version of the original, is now available at Amazon.com. The Truth at Last presents many remarkable and enlightening new findings, eyewitness accounts, and never published revelations from unimpeachable sources including three famed U.S. flag officers and iconic newsman and Earhart researcher Fred Goerner’s files that reveal the truth about Amelia’s death on Saipan, as well as the sacred cow status of this matter within the U.S. The Truth at Last is far more than just a book that’s been completely blacked out by the mainstream media; it is the most visible and tangible symbol of a most worthy cause — the full and unconditional release of the truth in the Earhart disappearance by the U.S. government. Once again our “trusted” the media will blatantly ignore this book, because the truth is the last thing they want you to know. Until that day arrives, the struggle to achieve Fred Goerner’s “justice of truth” for Amelia Earhart, Fred Noonan and their tattered legacies continues. And unlike any of the countless causes you might encounter in today’s mega-media marketplace, this cause is untainted and unconnected to any known political, religious or cultural organization or agenda. Your support for the Earhart Truth is greatly appreciated. Thank you. (Editor’s note: Some of the more perspicacious readers of this blog know that the very same day Part I of “Irene Bolam and the Decline of the Amelia Earhart Society” was published, Dec. 29, 2015, the UK’s Daily Mail, followed by Fox News ran stories promoting a new book that, unbelievably, attempts to re-resurrect the absurd Irene Bolam-as-Amelia Earhart lie, as if this is something new and important that the world needs to know about! “Coincidence is God’s way of remaining anonymous,” is a statement attributed to Albert Einstein, and I suppose it’s more poignant than simply saying, “There are no such things as coincidences.” Could anyone be so clueless as to write a book in 2015 based on 50-year-old, discredited garbage, unless this is the latest government disinformation effort in the Earhart case, mixing the Marshalls-Saipan truth with the Bolam falsehood in order to discredit all three elements? By now a collector’s item, this is the back of the booklet Rollin Reineck sent to the few, including this observer, who bought Amelia Earhart Survived, several months after publication of the book. By then it was clear that Reineck had become thoroughly unhinged over this ridiculous idea. Bolam’s personal life history was thoroughly documented by researchers, eliminating any possibility she was Earhart. 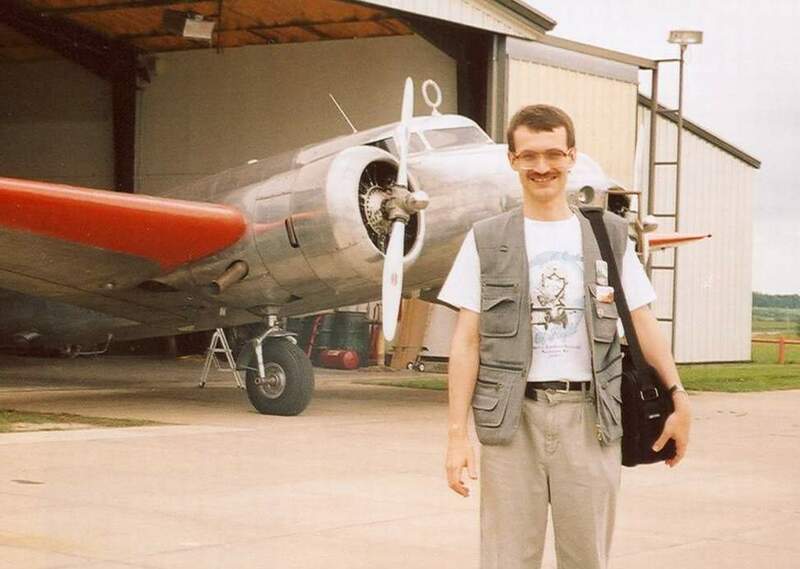 Kevin Richlin, a professional criminal forensic expert hired by National Geographic, studied photographs of both women and cited many measurable facial differences between Earhart and Bolam. Beginning in late 2002 and continuing until about mid-2006, the growing Bolamite wing of the AES, by far its most vocal subgroup, became increasingly more emboldened in its asseverations against those who dared offer solid research findings that questioned their dogmas. 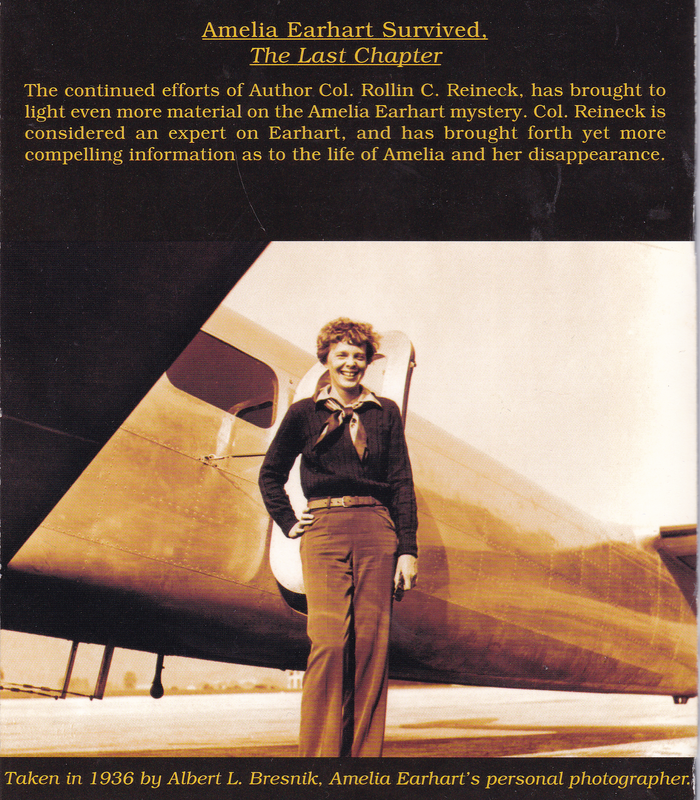 In early 2005, Reineck’s literary misadventure reached its final frontier, culminating in the publication of “The Last Chapter,” also known as “Chapter 13,” a small booklet produced as a supplement to Amelia Earhart Survived, an update, as it were, of the latest “innovations” in Bolamite thinking. In “The Last Chapter,” Reineck levels the most outrageous allegation yet conjured against Earhart – that she secretly gave birth in 1924 at the age of 27 to a girl he identifies as “Irene Jr.,” whom, he says, was adopted by Irene Bolam’s aunt, attorney Irene Mary O’Crowley, and O’Crowley’s mother, Sara Rutherford O’Crowley, who “became the little girls [sic] childhood Nanny” in Sara’s Newark, New Jersey home. Are you following this? As evidence for this incredible claim, Reineck cites a 1984 letter from family friend Lucy McDaniels, 83 at the time, to Diana Dawes, a close friend of Irene Bolam, recalling that in 1928 she “saw a baby in a crib” at Sara’s apartment. According to McDaniels, Irene Senior, i.e., Irene Mary O’Crowley, told her the baby was the child of her deceased sister, at which point Reineck interjects an author’s note informing us that Irene Senior did not have a deceased sister. “Of course I don’t know who the baby in the crib grew up to become,” McDaniels wrote, according to Reineck. As if to lend credence to this bizarre fantasy, Reineck presents an inscrutable diagram on the booklet’s next-to-last page, purporting to illustrate the family tree into which Earhart’s imaginary child was adopted. Needless to say, the person “Irene Jr.” never existed. 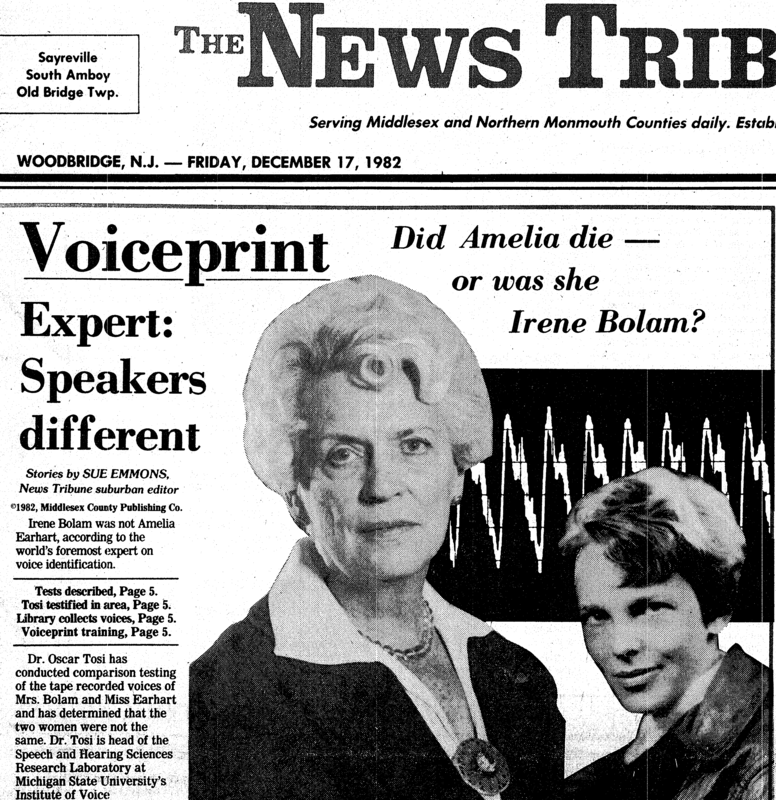 In mid-December 1982, the Woodbridge (N.J.) News Tribune published a series of investigative stories by Lois DiTommaso, News Tribune managing editor and other staff members, that fully exposed the obvious truth about the Irene Bolam-as-Amelia Earhart lie. Irene Bolam died of cancer earlier that year, in July 1982. In the booklet’s opening pages, Reineck credits the “investigative efforts” of Tod Swindell for this latest revelation, which isn’t the only new discovery he unveiled for befuddled readers. Inside “The Last Chapter” Reineck inserted a four-by-five slip of paper, titled “Preface,” in which he advises, “For ease of understanding ‘The Last Chapter’ (13),” there were “three Irene Craigmiles, two of them became Irene Craigmile Bolam.” The third Irene Bolam, Reineck wrote, was “the face on the 1982 [Irene Bolam] Memorial Dinner cover. . . . We can only speculate who she really was.” In fact, Reineck’s third Irene Bolam is none other than the first and only such woman, photographed at a younger age. The torturous logic through which Reineck declaims the existence of two Irene Bolams, the first of whom vanished without a trace to be “replaced” by Amelia Earhart, is already far beyond our ken. But in “The Last Chapter,” Reineck asks us to take complete leave of our senses and accept three such discrete persons. Further exploration of the preposterous Bolamite delusions advanced in this absurd addendum would be pointless. Sad indeed was the state of affairs within the AES in the years following the release of Amelia Earhart Survived. If the Bolamites weren’t busy launching vitriolic attacks and accusations of “intolerance” against non-believers, they were ignoring the most recent submissions in the ever-growing mountain of evidence laying waste to their claims. I experienced my own rude introduction to this “collegial” group in late 2002, when, before publication of With Our Own Eyes, I sent the forum its most important chapter, “More GIs Step Forward,” which presented the never-before-published accounts of two-dozen Saipan veterans that revealed the presence and deaths of Earhart and Noonan there prior to the 1944 invasion. The wall of silence that greeted this important new evidence told me all I needed to know about the AES and its so-called “search for the truth.” It was then that I realized any findings associated with Devine’s eyewitness account would be roundly rejected by this agenda-driven group, which, with few exceptions, is populated by non-contributing pretenders and aging cynics unwilling or incapable of adding anything of substance to their decades-hardened biases. During the 14 years since I freely shared the new chapter of eyewitnesses in an open spirit of cooperation, that opinion has been borne out in spades. Soon after Reineck’s posting of his “Chapter 13” on the AES forum in late February 2005, Alex Mandel wrote a rebuttal of the latest despicable allegations laid at Earhart’s feet. Mandel called it, “Amelia Earhart’s Survival and Repatriation: Myth or Reality?” and it later became known as The Atchison Report, the most comprehensive deconstruction of the IB theory extant. Mandel’s paper, nine single-spaced pages of unassailable logic, was met with abject silence on the forum, a certain indication of its efficacy. From the first rumblings of the IB theory’s baneful resuscitation in early 2002, to its unfortunate materialization in Survived, Mandel, trained in rigorous scientific logic, untiringly and enthusiastically deconstructed the steady stream of irrational Bolamite claims. More than anyone in the AES, Mandel did the hard things necessary to keep the IB myth in its proper perspective, inspiring others, who, while not in sympathy with the Bolamite faith, lacked the will or resources to confront it directly. You wrote, “Some researchers believe that Amelia entered the Massachusetts General Hospital in Boston sometime in late July and gave birth to a daughter which she subsequently turned over to Denison House for foster care.” Dear Rollin, generally – please why are you using at all this unclear and a bit foggy formula. “Some researchers believe” – as it is pretty well known that it is Tod Swindell’s theory, that Tod presented to the Forum several times? About the theory itself – sorry, but am forced to repeat that it is purely artificial invention, created specially for to “support” in some way the IB theory. Please see above for argumentation. … Mainly, as I can see, this theory is supported now rather by the ‘power of faith’ of the people who are reluctant to abandon this belief, against many already presented arguments conclusively showing that it is baseless. The silence on the forum following the introduction of Rollin’s “Chapter 13″ and Alex’s lengthy rebuttal is deafening. With so much material to discuss, I wonder why this could be? Is the polarizing nature of this issue such that some are compelled to hesitate in expressing their thoughts because they may offend one or the other parties, who have staked out such dichotomous positions? We’ve all been watching this circus for several years – most, like me, mainly from the sidelines – as the AE as IB idea rose from the ashes to dominate the forum. Nature abhors a vacuum, so I’ll jump in now since no one else will. The abject failure of Amelia Earhart Survived to impress or move anyone in the literary marketplace is compelling evidence of the academic and intellectual bankruptcy of its propositions. Although the ideas it presents have been consistently and convincingly debunked within our closed society by Alex Mandel and Ron Bright, their dedicated and protracted efforts weren’t necessary to condemn this book to obscurity in the real world, where it failed miserably due to its own lack of any redeeming merit. Longtime Earhart researcher and retired Office of Naval Intelligence agent Ron Bright, of Bremerton, Wash., along with the late attorney Patrick Gaston, of Overland Park, Kansas, located the 1971 defamation lawsuit filed by Irene Bolam against McGraw-Hill, publishers of Joe Klaas’ Amelia Earhart Lives, requesting $1,500,000 in actual and punitive damages. The absurd and ridiculous speculation they engage in – which has been granted currency by many within the forum – defies credulity. Ironically, despite the grave serial depravity the book falsely accuses AE of engaging in, Amelia Earhart Survived was doomed from the start by its own sheer weightlessness. Like its creators and adherents, who grasp at every wispy straw to support their delusions but refuse to recognize, admit or correct even their most obvious, egregious errors as they build their house of cards, “AE Survived” is an utterly unserious book, a parody of academic inquiry, laughable in its pretentiousness and pathetic in its presentation. Alex Mandel’s comprehensive and erudite rebuttal of Rollin’s “Chapter 13” is a clear reflection of his ongoing passion, attention to detail and unselfish willingness to do the hard things necessary to produce true research and oversight based on established biographical and historical facts, irrespective of the outcome. Alex is also a serious, highly respected academician with a Ph.D. in physics (a rigorous science with little or no tolerance for speculation), an author of several Russian books about the U.S. Navy, and a longtime Earhart devotee and bibliophile with no horse in this race. 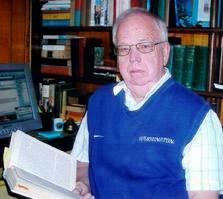 His ideological opponents will downplay and deprecate his achievements while extolling their own, but along with Ron Bright, Alex has been a beacon of reason and light who performs an invaluable service for all in the AES forum who are solely interested in searching for and discovering the truth about the fate of AE. The success of that search, by necessity, also means the abandonment of falsehoods, regardless of who is perpetrating them – or how long they may have been engaged in such counterproductive pursuits. The “controversial material,” of course, was the IB theory, and its main expositor was Reineck’s associate and technical advisor, Tod Swindell. On June 14, 2005, Swindell posted a message regarding the Joe Gervais Memorial Dinner that several AES members, including Prymak, were planning for Caesar’s Palace in Las Vegas on June 25. Swindell ridiculed the event, and called it a “mock lionizing tribute” to Gervais, because some of those in attendance, notably Prymak, did not embrace the IB theory, despite the fact that it was solely Gervais’ creation and Prymak was a close friend of Gervais. For Prymak, Swindell’s characterization of the memorial dinner for his longtime amigo was reportedly the last straw, though five full months would elapse before he sent his official notice of resignation to the AES forum. In his letter, Prymak called Swindell’s remark “truly shameful and disgraceful,” and reminded Reineck and the Bolamites that the Amelia Earhart Society name was his creation and remained his property. In my next post, we’ll continue our Irene Bolam retrospective and delve more deeply into the rotten core of this absurd canard, and pile plenty more facts on the growing heap of evidence that leaves no doubt as to its falsehood. I’ll also present some of the most humorous missives ever penned about the Irene Bolam-as-Amelia Earhart fantasy. Be sure to tune in!